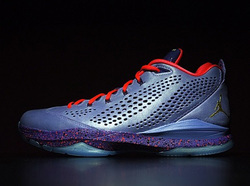 JORDAN CP3. VII "ALL STAR"
As we seen before, Chris Paul's signature shoe takes on another All Star colorway. This colorway features an all purple upper, with hits of red. We see a darker purple used for the midsole featuring red paint speckles. To tie it all up, the shoe is completed with a translucent outsole that is featured in every Jordan Brand signature athletes shoe for the NBA 2014 All Star Game. The whole pack is set to release February 14, 2014. This is also the same release date as Nike's All Star pack. Make your decision wisely on what shoe you will pick up and from what pack! Stay tuned for more information on these! 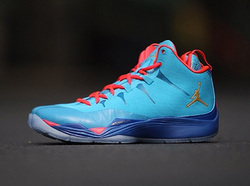 JORDAN SUPERFLY 2 "ALL STAR"
This is the second time we've seen the Jordan Super Fly 2 take on an All Star color way. Last years All Star color way was Volt and Grey. This year the shoe takes on a light blue base, pink laces and outlining. A darker blue is used for the midsole. The bottom is a translucent sole. We would imagine seeing Blake Griffin laces these up for the 2014 NBA All Star Game in New Orleans. Stay tuned for more information on these! Make sure to check the release date tab to see when these will be releasing. JORDAN XX8 SE "ALL STAR"
All Star Weekend is set to hold a lot of new Jordans. Not only will there be a handful of retro releases, we will also see performance models releasing. The Jordan XX8 SE takes it's first run in a All Star color way. The upper contains a crackled print. The laces and heel tab look to have a hit of crimson. As we see being more and more now a days, the sole of the shoe is translucent. There are hits of black all over the shoe, including black on the midsole. Stay tunned for more information about the Jordan XX8 "All Star." Check out the release date tab to see when these will be releasing! The Jordan 28 will be ending its run soon. The 28's have been a love or hate shoe because of "bag" look. Then Jordan pleased the buyers by releasing the 28 SE; It has a different look, but still an all-around great performance shoe. 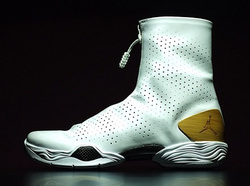 Today we look at what might be the last of the 28s, it is the Jordan 28 'Bamboo.' It has an all white upper, midsole, outsole, and zipper. Then we see what looks like wood on the back of the shoe. This is where a carbon fiber plate usually is. When you unzip it, you will see a black tongue with a white Jumpman and black laces. This is a very clean look for the 28. We usually seen a very colorful and eye popping colorway. All we know about the release is that it is in February. Be sure to check the release category later on to know the official date. Recently, some photos of a new Jordan 14 have been floating around. I believe that it will be called 'Thunder' because of its resemblance of the 'Thunder' 4. The only difference I see by color is there is a white hit peeking up from the traction pattern. The 4 released in December around Christmas, will this be another holiday release? We haven't seen a 14 for along time. It looks like its going to be nice martials. There will hopefully be more information on this soon.